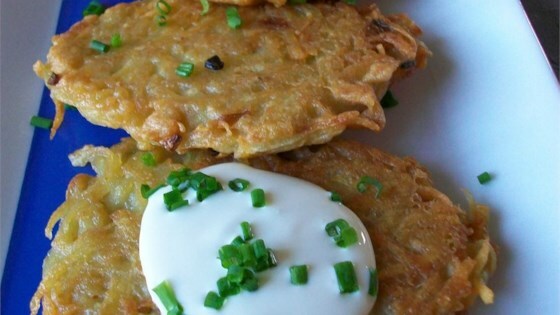 "A classic potato latke, you can't go wrong with these crispy hot cakes. Serve with applesauce, sour cream and chopped green onions! Happy Hanukkah!" ok, so latkes might not be for me, and they definately aren't for the boyfriend. while i could eat them, and they weren't bad he just couldn't get through it i'll be making him something later. I love making Latkes the easy way!! I use the Simply Potatoes already grated! They make wonderful and delicious Latkes!! This was AMAZING. I didnt have peanut oil so I used vegetable.